MaxAir is a swing ride in Wicked Twister Midway at Cedar Point. It's worth seeing on a time-permitting basis. 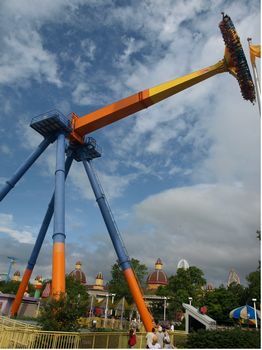 The minimum height to ride is 52 inches. A Huss Giant Frisbee. Maxair sends riders swinging 140 feet in the air at 70 mph while also spinning 12 times per minute. It's an airtime machine.